Sir Isaac Newton is a famous physicist and philosopher of the 17th century, whose intellectual power, inspiration and systematic imagination found no equal one in the whole history of science. His contribution in the development and progress of mathematics thought still remains unsurpassed. 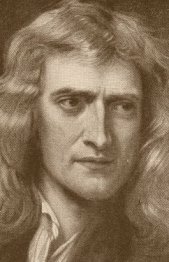 Newton was born on December 25, 1642, at Woolsthorpe, Lincolnshire. His father, a farmer, also named Isaac Newton, died very shortly after the birth of his son. His mother Hanna got married to another man, so little Isaac was brought up by his grandmother. Even having a lack of parents’ attention, he had very happy and joyful childhood. In 1661, after finishing Grantham Grammar School, Newton joined Trinity College in Cambridge, where he was creating his early works and theories. Newton is considered to be the scientist, who actually formed the structure of Mathematics and Calculus the way we all know it in our modern epoch. In his principal work, “Philosophiae Naturalis Principia Mathematica”, which he published in 1687, he reshaped the main principles and systematized his mathematics knowledge in order to make it applicable for his physics theories and experiments. In other words, he started using a number of own mathematical approaches for better formulation and expressing his discoveries in physics, like, first of all, his famous laws of motion and the theory of universal gravitation, etc. One more significant contribution of Newton in mathematics knowledge was his Direct and Inverse Methods of Fluxions, which he was developing during investigating of mathematical category of series and methods of interpolation. It is known now as the Theory of Differentials and Integration (the name was offered by Leibniz, who was working on the same issues at the same time, but independently from Newton). Newton offered famous Method of Quadrature for integration using graphics of the functions. He worked on the Theory of Differential Equations: in particular, he invented Inverse Method of Tangents for finding the solutions; also he introduced the system of literal indexes. In addition, Isaac Newton created famous Binomial Theorem, which, actually, became the source of creating his whole system of Calculus. During his investigations in algebra, Newton has been discovering and systematizing some points of analytical geometry: in particular, he has formed the system of classification of curves as transcendental and algebraic; he has developed mathematical knowledge about asymptotes, axes, points, etc. The achievements of Newton at other fields of science were highly connected with his mathematics investigations of non-linear behavior of variables. Newton’s main development in physics was discovering gravity, and he applied this knowledge in astronomy and has been investigating effects of gravity on planets. He made a number of principal discoveries in mechanics and in dynamics, like, for example, developing of theory of static. In optics Newton has been investigating refraction of light and emission, or using his knowledge he constructed famous Newton Reflecting Telescope. 39 processes generated in 0.210 seconds.